My grip isn't what it used to be so "squeezing" out the water might not work so well. What about adding a handful of potatoes/onions at a time to a salad spinner to help remove the water? may work, if the holes are small enough. That looks like it's going to be a real nice recipe to try. I too thought about the salad spinner which may do a good initial draining but I kind of doubt that it will do as good a job as squeezing. I have done potato pancakes to use up left over mashed potatoes but have never tried them like this. Looking forward to trying this, maybe with a hint of cajun spice. Chef John, have you ever done sweet potato pancakes? If so, what would you change in the recipe to suit them? By giving out recipes so readily from your due-to-be-published cookbook, won't it diminish people's interest in buying the cookbook? My wife had a good idea (it may have come from Chef John originally... we steal his ideas all the time) - Use a potato ricer to squeeze the potatoes. You're left with the driest potatoes known to man. What's the purpose of soaking the potatoes? And what would happen if you didn't do it? @EcoEcho: a good salad spinner will do a fine job of draining grated potatoes. Don't overfill it and work in small batches. 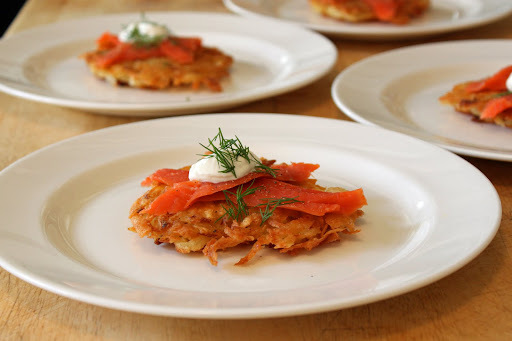 Ring molds or a biscuit cutter help make neater-looking potato pancakes. Just pack them loosely - not too thick - or they won't cook all the way through. Never had potato pancakes, but they look pretty good. I see you didn't add any salt to the water. On another recipe for potatoes I recall you suggested salt drives the water out making them crisp better. Same thing would apply here wouldn't it? I don't recall a potato recipe where I salted out draw out water. Which one? btw, BG, potato riced sounds like a great tip! Chef, I'm with Max: what does the soaking do? Are we saturating / removing the surface starch? Knowing that a dry potato was the goal, it never would have occurred to me to soak them for a half hour. rinsing removes a lot of the starch and makes for a cleaner, crisper potato. if not u get grey gluey ones. "A Fistful of Taters" starring Chef John! Not far off, TRICHTERWINDE, Chef John is like Julia Child in men's clothing. If I were to cook these on an electric frying pan, what temperature setting would you recommend? Please tell us how to make egg less Potato pancakes.. it will become a treat for us Vegetarians. I made these delicious pancakes last night..... they were soo RIGHT! The only thing I added was a few drops of hot sauce, which went well with the pancake. 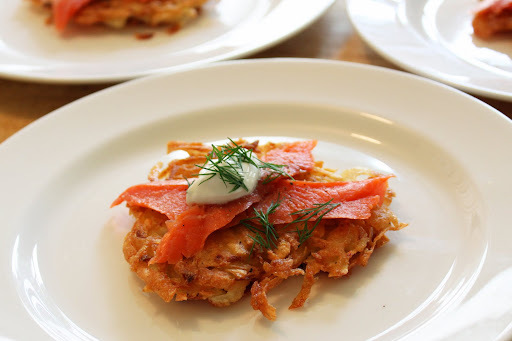 I had them with smoked salmon,dill and sourcream, poached eggs and applesauce. But honestly it didn't need any toppings. Another way to dry the potatoes is to put them in a clean tea towel (after draining very well). Then gather the edges of the towel together and twist. The twisting will force the remaining water out. Don't try this with a terry cloth towel, though. It needs to be a thin cotton towel. If you're really serious about extracting all of the water from your potatoes (and you should be), I urge you to go to a fabric store and purchase a yard of muslin cloth. (No, not Muslim, "muslin"!) Using a sewing machine, make a bag from the cloth approximately 6 inches wide by 10 inches high. Put your wet grated potatoes in the bag (a cup or two at a time) and then squeeze & twist the bag with all the strength you have. You'll end up with all but bone-dry potatoes, just the way they should be. i agree with Allen, my grandma always uses cheese cloth to get rid of the water in the grated potatoes. I also recommend you try topping this with left over irish stew, because i swear nothing tastes better. If I'm alive when I wake up tomorrow I'm going to make these for breakfast. I have the potatoes, I have the onion, I'm going to use the power of my mind to simulate the smoked salmon though. Can you tell me which are the most frequent mistakes? I think i made a few. I took out all the water but my pancakes came out bland. Can I make these in advance (fried and all) and then freeze them? Then perhaps I could microwave them? Would they still be crispy and tasty or...? I made these following your you tube posting and they came out wonderful! I thank you for this. Its great to see some one make them. It's the way I learn best. If you want to freeze them, you could flash freeze them for 10 min. hot and then bake them in the oven at 400 degrees till they are hot! good luck and Happy Hanukkah! I have seen so many recipes that grate the potato, squeeze out the liquid and fry. I find them really distasteful. I have been trying to find a recipe like this for a long time. I have also tried to make Hasselback potatoes, but I find them to be gluey also. Do you have any suggestions to remedy this? Thank you so much for the recipe and the short videos that reenforces your instructions. Can you make them in advance? like the night before. Can I make this recipe in advance? Like the night before and just warm them up for breakfast. How many potato pancakes does this recipe make roughly? Ive failed with a few different recipes in the past and was ready to give up making them until i stumble upon your site. Made it twice now.... once following your exact instructions and once substituted a parsnip for one of the potatoes(gives it a different lil kick). Hi chef John! :o)) I was wondering if these potato pancakes can be prepared ahead of time and frozen individually until they are needed? If so, what would the procedure be then? Are these the same as Rosti? Quick question: what happens when you DON'T make them super dry? What happens when you don't get them dry enough? they don't get as crispy! To your recipe, I added 1 tsp each of coriander, cumin, and garam marsala and then 2 tsps of curry powder. I also doubled the salt and threw in some finely chopped cilantro. The pancakes were then fried a bit longer until they're a deep golden brown and then put on a hamburger bun with shredded head lettuce, tomato, diced red onion, sour pickles and a nice dab of curry mayo. Holy Amazing!! Best potato pancakes I ever had. One thing though, I didn't bother peeling the potato and they still came out great. First time ever soaking them first too. Totally worth it. Thanks! I love this recipe Chef John! I halve the recipe (cooking for 2). Just wanted to mention that I drain the shredded potatoes in a sieve while I line my salad spinner basket with several layers of paper towels. Then SpinSpinSpin - Dry! Beautiful, golden, crispy potato pancakes! I like to mix in minced chives before cooking. Yum! How many servings will this recipe make? Thanks. Thanks Chef J. These are awesome. I always write down the instructions and ingredients for your recipes as I watch the video the first time. Then I get to try out your techniques and they have not failed me yet. Keep up the good work! All I can say is mmm, mmm, and mmm. I just added some garlic powder BAM !!!! Hi Chef John - I'm a big fan of yours. I made the potato pancakes yesterday and wow they were delicious and crispy! I've attempted to make potato pancakes before but they turned out grey and gluey. No wonder. The other recipes didn't mention pre-soaking and rinsing the grated potatoes before frying them. Well, in addition to making sure that the potatoes are completely dry, the soaking and rinsing is the secret to making these amazing potato morsels! I use a salad spinner also, but I only make about half as much as this at a time. I also wanted to add re the person who mentioned muslin; cheesecloth today has a much larger weave than decades ago, so muslin is a lot closer to what old-fashioned recipes called cheesecloth. But I went a step further - I bought a set of muslin pillowcases! Some I cut up, some I left whole, they have various uses in the kitchen and go right in the washer when done.